Once upon a time I mentioned that I would share the members of the Private (server) Army. The problem for me and my stickler for things, is that I refused to do so until they were at a point where I was happy with them…Transmogrificantly speaking anyway. Yes, I’m choosing to make up the word Transmogrificantly. It’s gotta catch on better than “dab.” So while this is the first character I’m posting, none of the others are quite ready to make an appearance for one reason or another. But they’ll get there and I will post as they do. When I rolled on the server I decided I wanted one of each class and no repeat races. Being as there are only 12 classes that meant one race was left out. Sorry Night Elf lovers. It came down to Trolls, Night Elf, and Humans and only Warlocks and Shaman left to assign. For today, though, we’ll focus on the Worgen, who takes up the Hunter slot. Soundwaive and his loyal companion, Tone’loque. Soundwaive started out Marksman. However, I was doing some questing in Sholazar Basin when I hit level 80. I decided to leave the zone, but because I was close enough I decided to check the spot I had always seen Loque’nahar before (east of the Savage Thicket, up on a hill). Sure enough, there she was and that meant a change in spec. Absolutely worth it. Despite what Mrs. Amateur says, Tone’loque is clever. Then I got the idea to put together an outfit that complimented the pet and I think it came together really well. The only thing missing is the Mechanized Snow Goggles, because I can’t find Borean Leather for the life of me…and my Skinner isn’t high enough to go get me some. Soundwaive is the third private to arrive in New Dalaran. With 100 levels under his belt he’ll be deployed to Aszuna soon enough. But first he’s going to spend some more time in his lab, further developing his Engineering and Alchemy. So close. Alas, the new patch means I missed out on the Quintet achievement. With a couple of days now to peruse and test some of the features brought about by the pre-Legion patch, I sat down with the army to get their immediate thoughts. I’ll share mine afterwards. Liouxpold: WHERE ARE MY ANIMAL FRIENDS?!?! ?…oh, they have moved the stable. Logard: I no longer have to use this bow like a coward? Excellent. Hartley: Now that the Skullflame Shield is across the account, you’re not going to kill me, are you? Vastego: Give me the Fabulous title already. Zarahi: The soldiers in my Garrison no longer bring in money. I shall feed them to the creatures of Tanaan. Elcombe: Does this mean I can finally leave Northrend? Siori: A pistol? What in Elune’s name am I supposed to- *headshots an Orc* …nevermind. We’re good. Um, so…yeah. The new patch content is certainly interesting, to say the very least. The new transmog system is pretty solid, with Blizzard clearly adapting MogIt for in-game. I definitely applaud the move, particularly the ability to finally hide shoulders! Sharing gear across accounts is also fantastic. Nothing like taking your Rogue into a dungeon for two months and never getting the drop you want, but your Druid on another server gets it on your first run. The class changes are just too many to discuss, and some I am just too low to properly gauge. But I will say the Outlaw spec for the Rogue is interesting. I don’t know if it’s the talents I have chosen or I just haven’t looked up rotation but I find it to be very heavy on stun and attack together. Slice & Dice as a Level 100 talent I’m not to sure of. Particularly when I find Roll the Bones to be ineffective for the most part. Could just be my relationship with RNG. The Hunter now has the most diverse specs and all three feel really good and unique. I still have to get used to getting into the fight with Survival. Unfortunately, Liouxpold loves his range weapons so for the first time ever he is no longer that spec (just Logard is at this point). He still thoroughly enjoys Beast Mastery though. The change to adjusting talents is fantastic. Just having to move to a rest location and being able to change spec or talents is phenomenal and long overdue. It’s something I honestly never even considered and now wonder why it wasn’t a thing ages ago. Glyphs are gone and I’m personally not upset about it. There were only a handful that were used for major slots, so many were redundant. After all the years of Blizzard saying they trimmed the talent trees because powers weren’t getting used, glyphs were a natural evolution of that thought. Though I will miss some of the minor ones like Confession. Even Siori tried to Sprint on water, much to no avail. Obviously without being a raider, it’s hard for me to truly gauge what the classes are like now. I’ve heard from beta testers that most are really solid at 110, and that’s good to hear. What I can say, from a casual player’s perspective, is all the experiences I’ve had related to the new features and changes are fantastic. I’m sure there will be bumps along the way the deeper I delve, but thus far the developers really seem to have nailed this one. A few days in and we’ve definitely got a feel for the new flavor of WoW. Yesterday I talked about the many immediate changes that bombarded us in the first minutes we logged in, but now the details can be absorbed a bit better. Class changes are interesting. The only thing I had to do on Saintvache was choose two new talents. His action bars went nearly untouched. I could not say the same for Tumunzahar, Siori, and Liouxpold. Perhaps it’s an Alliance thing. Speaking of classes, many people found Burnt Glyphs in their possession now. Rest assured that’s just for Glyphs that are no longer in the game. 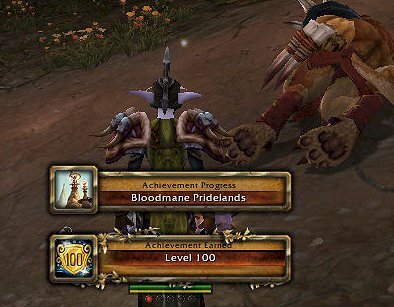 I completed the Iron Horde invasion on the Horde side, and while I don’t know the details of what is to follow, I really hope it isn’t done now. I came out of it with a title and a new pet, but incredibly underwhelmed. That and agitated because Thrally-Sue (which I think I’ll call him far more often now) had to be the one running around on the front line. Really? There couldn’t be anyone else? The guy had a whole expansion dedicated to him (Deathwing was merely supporting cast) and still we get him shoved down our throat. Not to rant too much, because up until the later parts of Cataclysm I actually liked Thrall. It’s just that Blizzard has overplayed him. Getting back to the Iron Horde, it seemed pretty linear and to the point. I’ll have to flip over and give the Alliance side a try before I really assess it but I can’t imagine it is all that different. One no longer has to spend so much time in Pandaria. I logged into a toon and found it sitting at 100% XP, but hadn’t dinged yet. There’s no way in Dire Maul I would ever let that happen. The OCD in me would have to ding before I logged. Particularly because that’s less than exploratory XP. That’s more along the lines of “you dinged because the wind changed direction.” Now, to confirm this is the case, I played for a little while and had six bubbles in half an hour. At 88. Hrm, this place really might not be that bad anymore. The final nugget of “huzzah” is stacking. Imagine my surprise when I had the bank open and decided to top up my stack of Dreamfoil and sell the rest. Suddenly I had a stack of 28! I began playing around with this immediately, finding eventually that stacks cap at 200 now. Between that and the Toy Box my bags are bordering on empty (and the bag sort feature is fantastic). But what it really excites me for is my guild banks. For Claws, it just means having a cleaner bank. For the auctioneer in me, it means more room to store goodies. I mean, just look at the difference in one tab. It wasn’t 100% good news, though. On top of shelling out gold for some face lifts (I think I spent about 200g or so in total. Obviously someone with more 90’s than I spent even more), I found that some gear held onto its transmogrification, while others reset. Needless to say, many of my toons look incredibly goofy so I will have to correct that when given the chance to. I’m sure many people knew about these changes already, from playing the PTR or reading about it. For me, I have been incredibly removed from these details of the game as I’ve been merely puttering in it for the past few months. I vaguely kept tabs on what’s going on and really didn’t read the changes ahead of time (of course I knew about character models). Thus, it’s all a surprise. It feels like a good surprise, and I have a feeling I’m not the only returning player to think so. Having decided Liouxpold needed a new look, I began puttering around with MogIt to see what I could come up with. Unfortunately I wasn’t having much luck, so I went off in search of some new Hunter pets for him which I found in the form of Vexxus, Gabriel, and Yrra. I then focused back on a transmog outfit and decided to start with a bow. 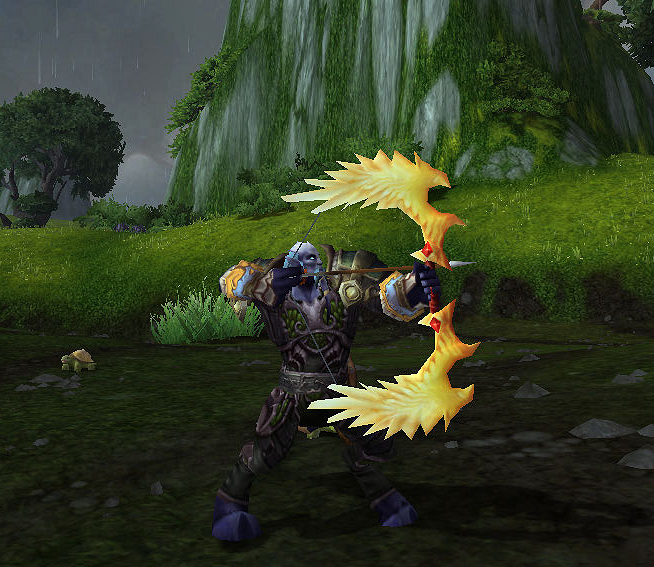 Yes he has Black Bow of the Betrayer, but I was looking for something different. 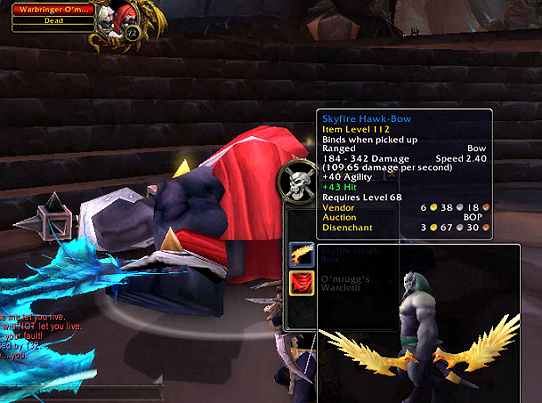 I settled on the Skyfire Hawk-Bow, figuring I could work on the rest as I go. I headed off to Shattered Halls and it actually dropped on the first run. A nice white cloak, Mantle of Vivification, also dropped so I decided these two pieces would be my starting point. Thanks muchly. You shall only perish once this day. When I previewed the two pieces in MogIt I accidentally had “current gear” in the view and realized the Barrel Stacker’s Mitts that he was wearing fit as well. Now it was a matter of off-setting all the vibrancy with a core that was darker. Initially I wanted blue, but that was before deciding on the gloves. So I just started previewing shirts to see what would come up within my current means. 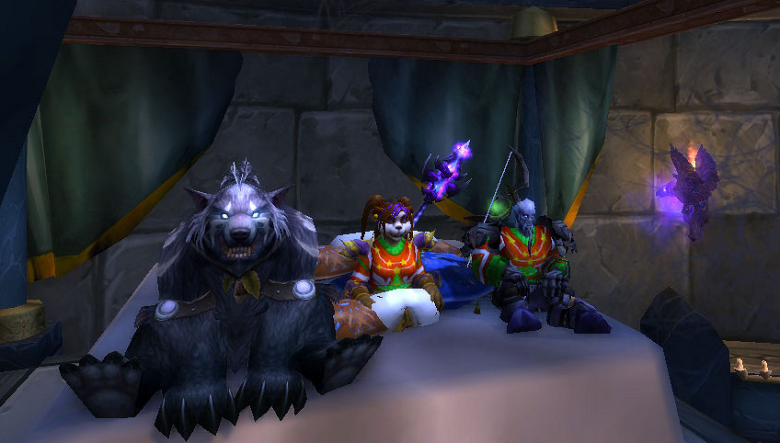 Shirts that required honor were most certainly out for now, as was anything 85 or 90 level raids. What can I say, I’m impatient and don’t like chance. I’d prefer to be able to build the outfit in the moment. I settled in on Savage Gladiator’s Chain Armor. I looked through the leg slot, but admittedly ended up cheating and going with the matching Chain Leggings. Most of the time I don’t use existing set combinations, but once in a while it’s ok. Plus, in this build I stopped at two pieces. The shoulders and feet are both crafted, Vicious Dragonscale Shoulders and Tsunami Boots (yes, I could’ve cheated a second time and used the boots from the shoulder set but I specifically avoided doing that). All that was left was the belt. The one I ended up choosing had four versions and all of them were quest rewards in Twilight Highlands. I chose the Waistguard of Salvaged Happiness because it was a quest you could just fly into the zone and do. You need not have completed anything else first…and as an added bonus, it’s dirt simple to do. At the start, I wanted the bow to be the focal point of the outfit. Having the gold in the gloves helps pull it in, and the cloak completes the accent pretty well. The core green managed to achieve the contrast I was looking for. Though I just realized the colour scheme is not that far off from Siori, I’m still happy with the end result. It seems like just yesterday I was talking about how to run your own contest for Transmogrification. Right around that same time, oddly enough, I came upon someone’s contest. That someone would be Dragonray over at Azerothian Life. The contest? Around the World In 80 Mogs! Wait, no…that’s not quite it. Ah, found it. Mog The World In 80 Days! Head over there to get the full details, but if you’re looking for the short version from me first…it’s a 12 week competition with a different entry due each week. The emphasis is on countries, and more specifically mogging to match their flag colours with an outfit. I haven’t seen the list of 12, but man I hope Jamaica is in there. That would be a great colour scheme to build from. I also expect many entries to include the Scarlet Crusade Tabard if Canada is one of the weeks. So there’s the short version. I know there’s a panel of judges just as there’s been around here, though I don’t know what the criteria is to increase your chances of winning. Personally I’m not concerned as I just look forward to using this as a chance to get some old fashioned mogging done and submit my own entries. The other day I managed to put in some time on Saintvache, pounding baddies in Pandaria (in Illidan’s name, it’s so much easier to quest as a Pally rather than a Holy Priest). Not long after I logged on, I got a pleasant greeting from a friend and it was followed by a question: how do I host a transmog contest? I can say that despite hosting a couple of my own, I never once considered this question. In pondering the answer I realized this was something I hadn’t seen discussed in the blogs much, so that gave opportunity to this particular post. The first thing you need to do when hosting a contest for transmogrification is figure out just what the theme or main concept is going to be. This is usually not too hard because the idea to have a contest stems from what you want the participants to try and do in the first place. But in this, it doesn’t hurt to scratch out some guidelines you want to have in place either. You can always go back and fine tune things but a few general ideas are helpful as it keeps you focused on where you want things to go (and guidelines make it easier for those taking part, too). Decide on what formats you will allow for entry. I’ve seen cases where entries had to be in-game. If the goal you have set out isn’t terribly difficult then this is fine. Otherwise, this really handicaps entries. Not everyone has the resources, time, or even luck, to get the items they want to make what they think is the ideal outfit to submit. Allowing the use of MogIt and other such outfit makers is a must. How long are you going to give people to enter? Short notice reduces participation. Too much time and people sometimes forget about it. There’s no real answer on the ideal but if you’re doing multiple rounds you also have to begin to consider what becomes too taxing on people. That’s why I gave everyone a month to enter the Mogolympics, so they could get all the outfits done and entered rather than calling on one at a time. Of course, there was also a massive amount of entries, which made that decision work in my favour in the long term. Bottom line is give your entrants, and yourself, plenty of time. Are you going to do prizes? Sometimes it’s fun to be able to tie into the theme of the contest by offering up a prize or two. But there are times when the Transmogrification community is content just to have bragging rights. Don’t feel that just because you can’t afford to attach a prize to your event that it means you can’t hold one. Also never underestimate folk making donations. Just don’t count on it either. Do it however you want and people will still take part. Depending on the size of the contest, do not be afraid to ask for help. Whether it’s graphically, organizationally, or the most common assist: judging. There are many people who if the time allows will be happy to help out. If you don’t know anyone, ask around. Or, ask around here. There’s plenty of regulars here that have helped me and others in the past and no doubt will continue to do so. With the help idea comes the biggest piece of advice I can offer, and that is do not underestimate just how much work can be involved in running your own contest. I like to think the finished product always looks good on the blogroll but if other hosts are like myself, then a lot of behind the scenes work goes into what you end up seeing. Then again, perhaps I’m just finicky. That said, if you’ve got an idea in your mind of your contest in the first place then you probably have an idea in mind on how it will play out. Most of the effort into getting that end result falls on your shoulders and you need to realize that sometimes it means more than you expected. You need free time to stay on track. The more involved the contest, the more involved the work (is it any wonder I’m not doing a winter Mogolympics?). I don’t say any of this to overwhelm you or scare you off from doing a contest. Quite the opposite as contests tend to tighten the community and even add new faces. That can never be a bad thing. But the last thing you want is to launch something and then see this giant snowball coming down a mountain on you just getting bigger and bigger as it rolls closer. By knowing beforehand what you’re in for, you can be on top of the mountain instead of below. Ideally, you’ll also be able to set up your own event nice and easy. If you do, be sure to send me an invite. The weekend that was ended up being a weekend of raiding -casually, of course. The Mrs. and I were faffing about on the TImeless Isle (man is that place easier for a Priest when you have someone with you). I managed to figure out the pillar Treasure Chest and get to it before a Troll Priest. We also chased Evermaw half way around the island…in the water, and to no avail. But Tome came on and in striking up a conversation with her she wondered why I wasn’t there with them. Well, I didn’t really know where “there” was and who “them” referred to. Turns out it was Old Ladies’ raid night. Moments later, the Amateurs were in Dragon Soul. This was my first Laid Back Raid since I stopped doing Laid Back Raids when I stopped playing last winter. More than anything, it was nice to see some old friends (many of which were there with new faces to play with). We enjoyed ourselves collectively and got as far as Ultraxion before it was called off. I believe that to be the case as we weren’t in vent and the group disbanded rather suddenly. If you’ve read the blog for any length of time you know Kara remains my favourite instances in the game. It was great to go through it again (no mount) and remember why. It’s also like the dungeon itself missed me. I out-rolled the Mrs. and snagged the Fiendish Imp (it ended up being the lone pet to drop), and that was after The Curator finally dropped the Dragon-Quake Shoulderpads. I farmed those for the longest time after Transmogrification was introduced as I had designed an outfit around them for Liouxpold. Of course, I’ve long since moved on but will have to go back and put something together for him. Between the two nights it was great to lean back with some friends and bounce through the two raids. When you leave the game for any length of time and try other MMO’s the first thing you tend to notice is things are drastically different if you lose the social aspect of it. Yes, there are thousands or millions of other players, but it can take you a millennium to build up a circle and odds are you’re not going to know them as well as your WoW “crew.” Plus for some, randomly becoming buddy-buddy with people just isn’t going to happen. Being gone I missed the folks I knew and this weekend was a lovely reminder about part of the reason for that.